....the Artists of Creative Recycling Gallery present inspiring, contemporary, concept driven work, harmonising skill and imagination in the process of recycling discarded waste materials into free-standing and framed artworks. Contemporary in design, original and affordable. In a creative and responsible way Creative Recycling tries to make something out of household and general waste matter. We do not try to re-use or make something out of every bit of waste not use waste in every process. It is about a wider aspiration, and the intention to INSPIRE others to recycle whenever possible and promote sustainable living. In addition to those materials which we recycle we use woods from SUSTAINABLE sources and avoid all toxic processes. Whenever possible we buy locally to keep transportation to a minimum. 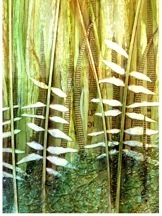 Paper Making, Collaging and Glass Fusing. This enables us to fully respond to our commitment to recycle. By working with waste we are promoting alternatives to landfill and incineration using thrown away paper, fabrics, plastics, metals, glass slate, brick, lead and and a variety of wood waste. We receive no public funding for any of our own work or for the Gallery itself, Exhibitions and Craft courses. During the fourteen years on Beech Road, we have by our own capital, time and endeavour established this creative space. This is a not-for-profit business - as artists and craftspeople we all earn our living from sales of our artwork, and any balance is invested back in to the running and development of the Gallery space, paying workers and volunteers as well as support in the community, local charities, campaigns and groups. * Giving a choice of original Art Work produced to a high standard of finish at reasonable cost. *To re-use and recycle wherever possible when buying materials choosing those that are sustainable and fair-traded. * Avoiding any materials that at their source encourage exploitation of workers or cruelty to animals in their creation. Avoiding any toxic materials and process and keeping transportation to a minimum, using resources locally whenever possible. Working in a way that is not profiteering, and rather supporting charities and environmental campaigns. We ask all those exhibiting and selling at the Gallery to commit as far as possible to our ‘Working Ideals’ but we are open to Displaying and Exhibiting Art in a variety of Media, using a range of materials, including those which have NOT been recycled - i.e. Painting, Drawing, Printing, Photography. If you would like to enquire about displaying or selling your work with us, please contact us at the Gallery. We now have a team of supporters/volunteers helping us to broaden the base of the gallery's work in a number of ways. Their input is an important part of the efficient running of the Gallery, and helping to make the work accessible, in a friendly atmosphere.They bring with them many skills and talents, but we are also running training/craft sessions for our volunteers so they may develop their skills whilst they are part of the team. Since the establishment of Creative Recycling Gallery (nearly 15 years ago, and before that as Creative Recycling Handcrafted 15 years + ) fundraising for local charities/campaigns has been at the core the endeavour. We have raised many thousands of pounds for a variety of causes, supported brilliantly by our customers and supporters. Currently we are raising funds for Local Food Banks, Refugees, and local Homeless Agencies. We thank everyone who have so far responded to these efforts, and hope again to also raise money for Macmillan Coffee Morning at the national, annual event.